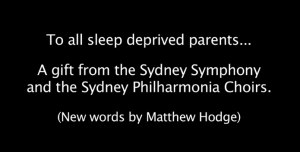 For Sleep Deprived Parents – Enjoy! This is so good. Enjoy! This entry was posted in Humour, Uncategorized and tagged children by Mamasim. Bookmark the permalink. I love it. I have been humming it all day!